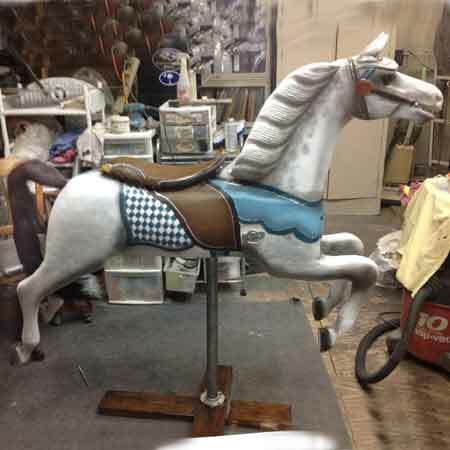 c.1895 - In the sweetly simple country fair style of the earliest carousels this figure from the Armitage-Herschell carousel factory in North Tonawanda, New York was created for a portable steam driven track machine before the invention of the overhead crank jumping mechanism-—therefore it has no through pole. The horse is in the jumping position and displays a pleasant face, an upright neck with carved skeined mane, a scalloped breastband with a carved foliate motif encompassing the chest. A simple floating saddle having a carved bird on the cantle rests on a checkered saddle blanket. The horse presents nicely painted as a dapple grey with brown and blue trappings enhanced with metallic silver. Glass eyes, natural horsehair tail, stirrup hangers, display stand as shown. ~49 long x ~45 high.